A Portaferry company specialising in breakfast cereal is celebrating its first year in business. 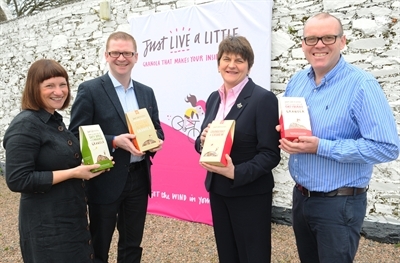 Enterprise, Trade and Investment Minister Arlene Foster and Finance Minister Simon Hamilton have congratulated local company Just Live a Little Ltd run by David and Jill Crawford on a successful first year in business. The company, which produces granola breakfast cereals, began trading in April 2013 and since then has developed a strong consumer base, with its products now distributed across a range of outlets in Northern Ireland, Great Britain, Hong Kong and online. Enterprise, Trade and Investment Minister Arlene Foster and Finance Minister Simon Hamilton are pictured with Just Live a Little Ltd’s David and Jill Crawford during a visit to the Portaferry-based business. Speaking during a tour of the company’s premises in Portaferry, Minister Foster said: “This has been a tremendous first year of business for Just Live a Little, with its expansion into both local and international markets. Food is a dynamic and progressive industry and our companies here in Northern Ireland have a strong record of success in terms of products being recognised for the outstanding quality that retailers, foodservice organisations and consumers are seeking. The Minister continued: “Just Live a Little is a great example of a company which is expanding its product range to take advantage of any emerging opportunities. These are strong building blocks for the future and I look forward to hearing of its continued success in years to come. Speaking to Down News following the first year celebration, David Crawford said: “In the first year we have succeeded in expanding our range and tapping into new markets. It has been a remarkable and successful year when we managed to really grow. We received great help from Invest NI both financially and through solid business advice around sales and market and product development, and we also received a very welcome investment from HALO, a businesses support programme backed by white knights who invested in our company. “We’ve gone through a rebranding of the business. We now sell in Tescos and will soon be in ASDA by the end of the year. We export quite a bit of our produce and we even made a very good contact in a supermarket group in Dubai. Currently we send our products to other areas such as England. But we would like to consolidate the regional market here first before we really have a crack at the UK market. But it is amazing that Birningham is about three times the population of Northern Ireland. “We are very confident our products will succeed. Demand is excellent. I first got the idea on breakfast granola when I worked with Clandeboye Foods. I looked after making yogurt there. My wife came across an excellent breakfast recipe and we worked on it and in a short time we were selling the early products. 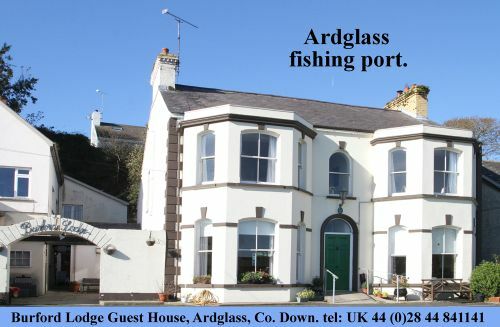 We produce all of our product in the converted barns beside our home in Portaferry. David explained that his small business was able to compete with bigger brands and still grow. He said granola was a quality product with an excellent shelf life. When they started off in business, they were working on a niche product, and its popularity grew, and now is is more mainstream in shoppers’ tastes. He added: “One key turning point for us was getting a contract with the Al Maya supermarket group from Dubai. They were in Belfast with Invest NI and we were very lucky to link up with them. They have been terrific to work with.